F&D Scene Changes was commissioned to repair and repaint the World’s Largest Dinosaur, towering at a height of 86-feet tall, 32-feet wide, and 131-feet long, posed numerous challenges. Chief among them was being able to access the entire sculpture. We needed to coordinate the use of four lifts and booms to reach every last area only using paint rollers for application. The need to repair the outer-structure was obvious as the layers of fiberglass had suffered delamination and cracking as water and moisture had seeped inside the dinosaur sculpture over time. 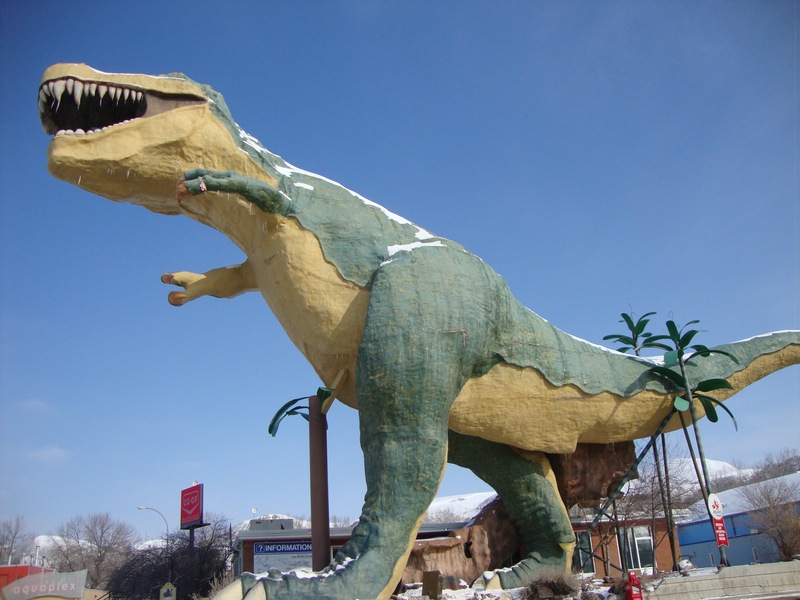 The damage was further compounded by the continuous freezing-thawing cycle and desert-like temperature fluctuations from morning to night found in the sculpture’s hometown of Drumheller Alberta. This constant expansion and contraction accelerated the breakdown of the sculpture’s fiberglass skin. To help in the ease of repairs, we kept to flexible materials that would move with the body, we opened up areas for drainage and air flow. After power washing and repairing, we wanted to create a new skin over the fiberglass dinosaur to help with the hairline cracks that had evolved, so we applied a primer that allowed for a heavy application of a thick flexible material. All told, 65 gallons of flexible coating were used in the process. We then repainted the dinosaur with a semi-gloss flexible high quality exterior paint, using 80 gallons of paint. This project took eight of our talented scenic painters 15 working days to complete. With a bright new paint job, this giant dinosaur is ready to pose with you for a fantastic photo-op on your next visit to Drumheller.